About The Engineer of Marine Hospital, Louisville, Ky.
Major Stephen Harriman Long (1784-1864), western explorer and topographical engineer, supervised the construction of the United States Marine Hospital in Louisville. 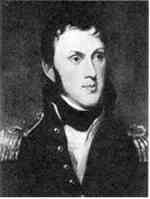 A graduate of Dartmouth College, Long entered the United States Army in 1814. After teaching mathematics at West Point for two years, he was promoted to major in the Topographical Engineers, the army's prestigious corps of skilled personnel with expertise in construction, mapping, and exploration. In 1820, Long led one of the earliest explorations of the Rocky Mountains. He was the first American to climb Pike's Peak. He also discovered and named a famous 14,255 foot mountain, Long's Peak, in Colorado (shown right). During his subsequent exploration of western Kansas and the Texas Panhandle, Long coined the term "Great American Desert" to describe the arid and flat environment. Long became one of the first engineers to specialize in railroad construction and wrote the definitive early study on railroad engineering. In 1845 Stephen Harriman Long was assigned to the Treasury Department with orders to build marine hospitals in Louisville and Paducah. While in Louisville, he also supervised removal of snags in the Ohio River, built dams and surveyed the route of two highways. During his supervision of the hospital construction, Long planned improvements and enlargement of the Louisville and Portland Canal. Construction of the U.S. Marine Hospital began in 1845, but was suspended for the duration of the Mexican War. Construction began again in 1847 and the hospital opened for service on January 1, 1852. Long subsequently served as superintendent of the Corps of Topographical Engineers until the unit was merged with the Army Corps of Engineers in June 1863.